Dr. Ricky has graciously offered me the opportunity to blog here while he's off playing volleyball in outer Uzbekistan. I'll try not to damage anything while I'm here. Take 1/4 cup of that nice dry cure, and rub it all over a pork belly. Cure it for 1 week in the fridge (in a ziploc bag). It'll dry out, and a fair amount of liquid will accumulate in the bag. At the end of the week, the pork belly will become firm to the touch. Wash it off, and put it on your smoker. Smoke for several hours (takes about 3) at 150-200F, until the pork belly gets to 150F internal temperature. Then chill in fridge, and slice off thinly. I screwed up the first batch of bacon. It was still yummy, but I forgot to peel of the rind. You're supposed to peel it off while the bacon is still hot, otherwise when you slice it, each slice of bacon will have a thin piece of skin on it. So, the first batch was yummy, but I thought I could do better. Dr. Ricky and I tried something new with the second batch - we each made our own bacon. 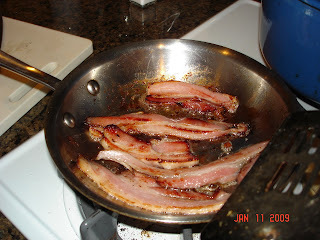 Dr. Ricky made the savory bacon - with garlic, bay leaves and pepper, and I made the sweet bacon, with added maple sugar. Cure as normal, and smoke as normal. So, how did they taste? The savory bacon was fantastic. All kinds of rich flavours in there that weren't in the previous bacon. 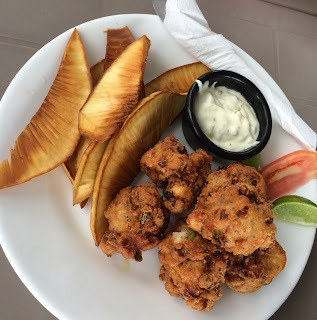 What can I say, I love garlic. The maple bacon was... disappointing. It was still better than an average grocery store bacon, but there was no discernible maple flavour. Just bacony, porkish goodness. Re-reading, I realize that even the maple bacon was fantastic. And easy. If you have a smoker, there's no longer a reason to purchase bacon. Homemade is sooooo much better. And cheaper. And really, not that hard. The most challenging part is slicing the bacon thin enough (I confess, I now have meat slicer envy. Mrs. McBardo isn't super excited that I'm lusting after meat slicers now, but that's another post, for another day). Well done. I knew Dr. Ricky was a traveling man, but didn't realize he had done the magic of bacon-making in SD and then volleyball-playing in ... wherever. I don't know if people check the old posts, but if you do I have a few questions in the pursuit of better bacon. 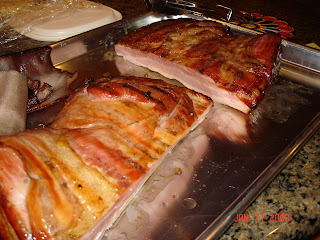 I've made the bacon from Charcuterie a few times in different ways with different pork. I've used the Olde World Farms belly you get frozen in 2 lb slabs at the farmers market on Eastside, the smaller cuts from Super H Mart on Blalock, and 3 lb slabs cut down at B & W on N Shepherd (the biggest rind). I've used a basic cure and some with sweet and savory spices. I've roasted them in the oven and smoked them over hickory wood at just under 200 degrees. I seem to always have the same problem. Not that much liquid releases during the curing process and the bacon doesn't fry up all that crispy. I can't decide if this is because I don't have a meat slicer so my slices are thicker than what you would get at a store or out of some basic problem with my cure. The biggest piece I've done is 3 pounds and usually prefer to do 1.5 to 2.5, as it is more manageable and fits into ziploc bags. I use the dextrose cure from Charcuterie (I have tons of dextrose if you want some). Any thoughts? Have you been able to crisp your bacon? Also, the difference between the savory and sweet bacon was negligible, though I eyeballed all the extras like bay leaves, garlic, pepper, and brown sugar. Thus far, my main use for it has been soups and beans, which has been good. But I think it could be better. I'll let greglor answer most the questions, as he has had more experience making bacon, but crisping up bacon after it's been cured - well, that's just a matter of how you're cooking it (which you didn't describe). 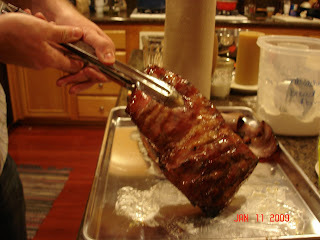 For the bacon we describe here, definitely, we've been able to crisp them up (greglor himself prefers things meatier). I'm a fan of cooking the bacon in the oven/broiler on top of a mesh rack.